Functional skills are everywhere – they are present all day and exist in every setting. Individuals with autism spectrum disorder (ASD) and/or other developmental disabilities may experience success in developing these skills in some areas and difficulty in other areas. This creates the need for developing a comprehensive program that provides a pathway to navigate successful teaching and learning. Without special training or tools professionals, educators, parents, and caregivers are often looking for systems and programs that will enhance their ability to provide their learners success as they move closer to independent living environments. The authors and developers recognized the need for autism resources, developing Functional Living Skills (FLS) systems to be practical and easy-to-understand methods of assessing and teaching independent skills. Assessment of Functional Living Skills (AFLS) has been created and includes its six interchangeable assessment protocols and a companion AFLS Guide to provide a continuum of over 1,900 skills across 66 areas. The AFLS assessment provides a dynamic pathway for lifelong learning, regardless of where any learner is currently functioning. Dr. Michael Mueller and Dr. James Partington have dedicated their careers to supporting individuals with autism and/or other developmental disabilities by working with other professionals, educators, parents, and caregivers in a variety of settings. 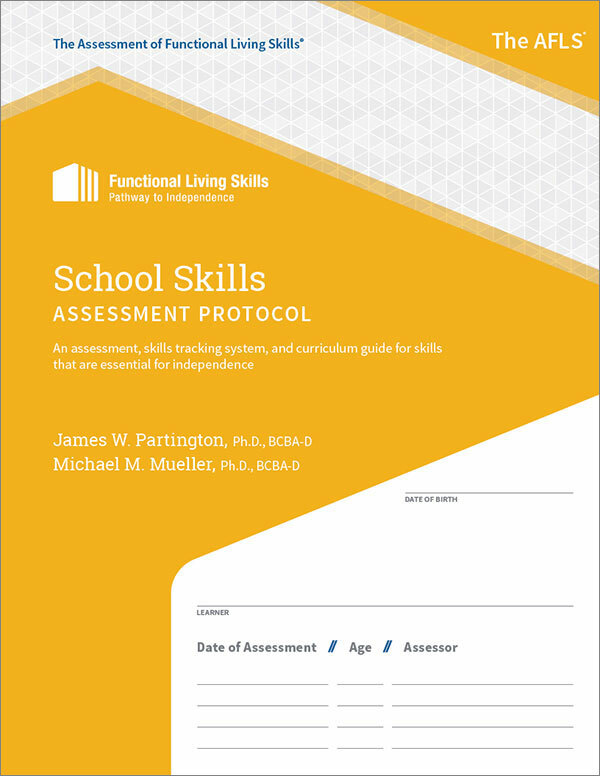 Through their research and expertise in the science of applied behavior analysis, they launched the FLS pathway through the development of the AFLS assessment system for learners of all ages. Learn more about the authors and their background.